If you love experiences and love staying at gorgeous homestays amidst peace and nature, Lonavala's Villa 39 is just the place for you. Go through the photos to see what we mean. 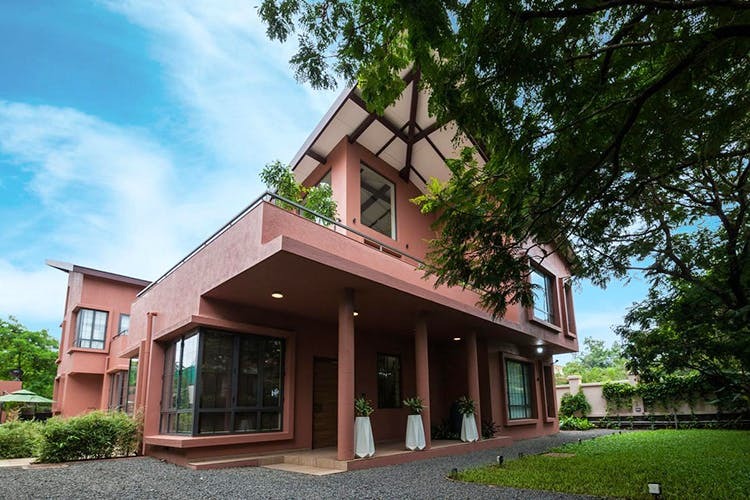 Just about 11 km from Bhushi Dam in Khandala, Villa 39 is a spectacular property against a valley backdrop, surrounded by nothing but moss greenery and all things nice. In a nutshell, the villa is exactly the kind of staycation that we will book for a sweet family getaway or when you want to vacay with your whole squad. The place has 3 massive bedrooms with double beds, that can sleep 6-8 people at a time. Villa 39 has an elegant colour-play of pastels, plush leather upholstery and quirky furniture pieces to make it look like home. Additionally, there is a spacious living room, a well-functioning kitchenette, a lawn, a terrace garden with swings and a swimming pool to keep you occupied all through the day. Sounds like fun? The prices are slightly steep, starting at INR 20,000 per night for whole villa. We wish they decrease the rates a bit. The villa allows barbecue parties too, however you need to let the host know in advance.